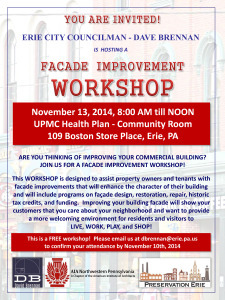 Erie City Councilman Dave Brennan, in partnership with the Northwestern Pennsylvania Chapter of the American Institute of Architects, the Erie Downtown Partnership and Preservation Erie, is hosting a Facade Improvement Workshop November 13, 2014, 8 am to 12 noon at the UPMC Health Plan – Community Room, 109 Boston Store Place, Erie. The workshop is FREE and is designed to assist property owners and tenants with facade improvements that will enhance the character of their building and will include programs on façade design, restoration, repair, historic tax credits, and funding. Improving your building facade will show your customers that you care about your neighborhood and want to provide a more welcoming environment for residents and visitors to LIVE, WORK, PLAY, and SHOP! Please email us at dbrennan@erie.pa.us to confirm your attendance by November 10th. 8:45 am Masonry – Matt Anderson, Northwest Restoration Inc.
Over the last three years, Destination Erie worked with residents throughout Erie County to build a more sustainable region by creating a plan to meet the economic, social and environmental challenges of the 21st Century. During Destination Erie’s most recent public ourtreach events, Preservation Erie contributed the following recommendations for project ideas. Preservation is viewed as a concept that encompasses entire landscapes, including open spaces, historic buildings and structures, farmlands, viewsheds and the distinct characteristics found in communities of all sizes. A Historic Preservation Plan provides local units of government a working document to identify these historic, cultural and natural resources in the county or municipality, and via the planning process, civic leadership works in collaboration with the public to consider preservation issues, problems and opportunities associated with those resources, explore the possibility of county-wide and regional approaches to management of important resources, and develop goals, policies and strategies for their appropriate use, conservation, preservation and protection that are consistent with those established for other comprehensive plan elements. A historic preservation plan should be completed for Erie County. This plan should be incorporated into the County of Erie’s Comprehensive Plan. The Erie County Department of Planning, in partnership with municipal leadership/representatives, Preservation Erie, the Erie County Historical Society, PHMC’s Bureau for Historic Preservation, and other key stakeholders, can use this plan to assist in the development of localized historic preservation plans that can be accepted, adopted and implemented by the county’s 38 municipalities. Through the planning process, concepts such as zoning regulations, design review guidelines and requirements for new and existing structures, preservation easements, preservation commissions, historic architectural review boards, historic marker programs, homesteading, land banks, mothballing of historic structures, and advocacy and public education should be vetted. We refer to the range of programs, laws, and financial incentives that are used to help protect and enhance historic places as the preservation “toolbox.” The tools in the toolbox include – but are not limited to – planning and zoning regulations, grants, tax credits, state or Federal laws, and resources/programs for homeowners. While some historic and cultural resources are owned and maintained by local governments, a tremendous number of historic homes, farms and commercial buildings are owned and cared for by individual property owners. In an effort to preserve the character and appeal of our downtowns and rural communities (for all of the reasons listed previously), and promote proper care of structures 50 years old and older, new resources/programs should be created and existing resources/programs (Erie Downtown Partnership, SNOOPS, Little Italy Neighborhood Network, Erie Redevelopment Authority, Community Development Block Grant Program) should be strengthened to provide property owners technical assistance regarding building repairs and ongoing maintenance, materials, and contractors and tradesmen, and financial assistance in the form of loans, grants and/or tax incentives. For example, a municipality may allow a tax break for single family residential property owners who are within a Historic District who have restored their structures according to the Department of the Interior standards. Erie Places, Erie Stories is a dual-faceted project aimed at fostering greater appreciation and understanding of Erie County’s historically and architecturally rich built environment. This interpretation project has two main elements—one, an illustrated, interdisciplinary series of streetscape exhibits located at narrowly defined building locales, places of well-documented historical significance in the life of urban centers within Erie County, Pennsylvania. A website with downloadable maps and other materials will accompany the exhibits. The second element is a grassroots effort to engage Erie County residents and citizens’ organizations in surveying the storied buildings and places that give communities personal and collective meaning and infuse built landscapes with unique character. A digitally published “Census of Erie County Places” (which will be ongoing) will be the final product. Erie Places, Erie Stories will support regional, as well as localized branding and tourism promotion efforts, public education and historic preservation advocacy. It will also inspire pride in community and re-root people in their neighborhoods and urban centers. Develop a civic leadership training initiative required for elected and appointed municipal leaders and senior managers of government agencies, and open to emerging leaders from our growing population of New Americans, young professionals, neighborhood associations, etc. The initiative could be structured as an institute or academy in partnership with one or more local college or university, or as a fee-for-service program of the Erie County Planning Department or a nonprofit organization with planning or leadership at the core of its mission. 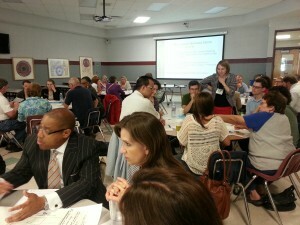 Curriculum should enhance the capacity of people to lead meaningful change and address (at the very least) land use, zoning regulations and code enforcement, understanding government finances and financial position, creating well-defined economic development ecosystems, revitalization strategies, effective citizen participation and the Freedom of Information Act, cross-sector partnerships, competitive bidding and grant writing, and best practices for multi-municipality collaboration. An urban growth boundary is a planning tool used to control urban sprawl, protect rural lands, focus investment in existing downtowns, main streets and employment areas, and promote efficient use of public services and facilities. Benefits of urban growth boundaries include motivating development and redevelopment of land and buildings in urban cores, helping to keep core (often historic) “downtowns” in business; assurance for businesses and local governments about where to place infrastructure (such as roads and sewers) which will be needed for future development; and efficiency for businesses and local governments in terms of how that infrastructure is built. Implemented in Erie County, this should be a multi-municipality effort. The Erie urban growth boundary (UGB) should collaboratively execute an intergovernmental agreement between the existing four developed municipalities – City of Erie, Lawrence Park & Millcreek Townships, and Wesleyville Borough – along with the developing next ring of communities of Fairview, McKean, Summit, Greene, and Harborcreek Townships (west to east). Other UGBs could be created between Erie County boroughs (and the City of Corry) and their immediate township neighbors.